"Seeking inspiration to be the inspiration." Do you remember the resolutions I made for the Holidays with Lidl? That this year would be different? No hassle, instead enjoying Christmas to every bit? One of my rules was to spend more time with my loved ones and involve them in my Christmas preparation. Baking is a perfect opportunity for it, so in my latest post I tried the recipe of the 'matcha butter cookie' with white chocolate ganache and raspberry jam filling from the recently published Édesem cookbook. Based on your sweet messages, it was a big success, I really hope a lot of you will prepare it around the Holidays. As a follow of my collaboration with Lidl's Christmas campaign, in this post I focused less on my kitchen and more on the other parts of my home. At the beginning of December I already started decorating my little nest but the finishing touches were still missing. I would have worked until Friday but I decided to take the last days off and focus on the last items on my to-do list: create with Lidl the perfect Christmas atmosphere in my home and wrap the presents for my loved ones. When it's about decoration, less is always more for me. A few fairy lights, candles, bouquets of hollyberries, my Advent wreath and a modestly decorated Christmas tree. If the latter ones are placed in the right corner of my home, I'm ready to start wrapping the presents with a big mug of hot chocolate in my hands and some Christmas music on. 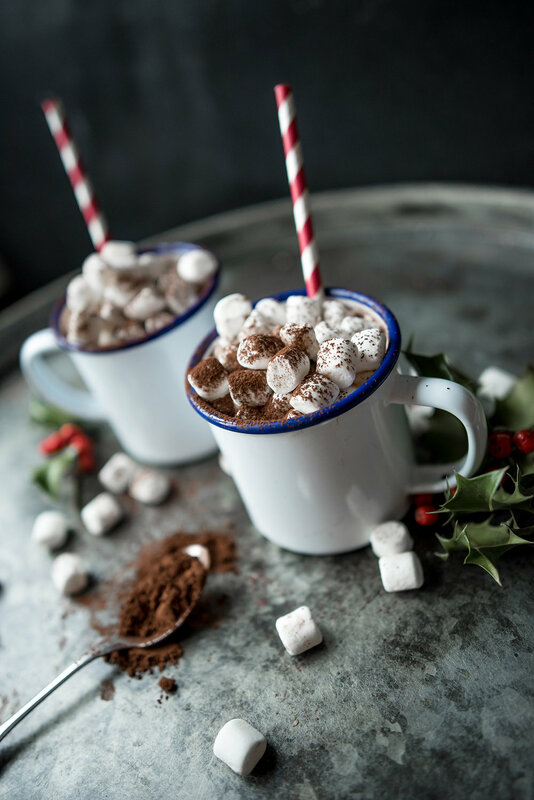 Whisk together the cocoa, sugar, salt, cinnamon and about 2 tablespoons milk in a small saucepan over medium-low heat until cocoa and sugar are dissolved. Whisk in the rest of the milk and the vanilla seeds and heat it over medium heat, whisking occasionally, until it is hot. Stir in the vanilla and serve. This post was sponsored by Lidl. While compensation was received in exchange for coverage, all thoughts and opinions are always my own.